Whether it was the gluten-free craze or the juicing movement, culinary trends seemed to influence the Inland Northwest food scene in 2014. Some entrepreneurs ventured into new territory to open meaderies and join the rest of Washington state in starting up hard cideries. The food truck revolution continued to go strong and, like usual, we gained a slew of new restaurants and inevitably lost a few. Last year, two cideries debuted on the not-yet-traversed Spokane hard cider scene. Liberty Ciderworks opened a tasting room downtown while Twilight Cider Works opened on Green Bluff, near the orchards where they source some of their apples. Hard cider kept its momentum this year, with the cideries joining the rest of the state in celebrating Washington Cider Week, which the Northwest Cider Association started four years ago. Governor Jay Inslee officially backed the 10 days of cider celebration with a formal proclamation. In the spring, One Tree Hard Cider started up and began brewing in Spokane Valley. And just a few days ago, North Idaho Cider opened their Coeur d'Alene tasting room and launched their first release, Lake City Cider, a crisp and dry cider made with Washington apples. Hard cider wasn't the only alternative libation to hit the local market. Hierophant Meadery and Apothecary started making mead, the extremely ancient — but new, in the sense that it's just now making a trendy comeback — beverage of fermented honey and water. Because the owners are both herbalists, they focus mostly on several kinds of metheglin (herbal mead). Launching in the spring, Fenwyr Cellars Meadery began crafting four varieties, including a Sweet Mead and a Huckleberry Dry. Certainly, "gluten-free" was one of the most pervasive buzzwords bouncing around food land in 2014. It seemed the global diet trend had everyone swearing off gluten and looking for yummier versions of the gluten-free foods offered in previous years. While the fad became somewhat controversial when a study said non-celiac gluten sensitivity might not exist, we can at least all agree that now our celiac disease-suffering friends have gained a whole host of eating options. In Spokane, throngs of restaurants added gluten-free items to their menus, but most notable are some of the bakeries. Alpine Bakery Co. closed down the bistro portion of their business to make room for a gluten-free baking room that produces several varieties of loaves, along with hamburger buns, croutons and pastries. With the extra room left over from the changes, a new coffee shop called Alpine Grind began operating the front of the bakery. The Shop launched a line of gluten-free cupcakes — branded South Perry Cupcakes — to accompany their already vast array of foods that include many healthy and allergen-free choices. Big changes happened over at the White Box Café and Bakery when they expanded their space along with their breakfast and lunch menus, with all of the items available without gluten. A new gluten-free face debuted on the scene when Cole's Fine Foods, a 100-percent gluten-free bakery and market, opened on the Northside. They pump out takeout products like artisan pizza, granola, crackers and cheese, scones, cookies and cinnamon rolls — you've got to try those cinnamon rolls. The Inland Northwest isn't exactly known for being the most health-conscious area in the country. Sometimes we're slow to catch on to healthy eating trends. But this was the year we finally decided to jump on the juicing wagon, and we now have several newly opened juice bars to prove it. Jack LaLanne would be so proud. While Method Juice Cafe has been serving fresh-pressed juice in downtown Spokane for a couple of years, until now it's been kind of a loner. But this summer several cafes making juice opened their doors. June saw the opening of Tierra Madre Cafe and Juicery in Sandpoint and Ephata Cafe in Spokane's Emerson Garfield neighborhood. The former serves their veggie and fruit juices and smoothies alongside vegan and vegetarian dishes; the latter pairs their juice with a Korean-inspired menu. The following month, the publisher of North Idaho Wellness magazine opened The Wellness Bar in downtown Coeur d'Alene, where you can get lots of kale, celery, cilantro, blueberries and bananas in liquid form. In the fall, grab-and-goers got a place to swing by and get a cup when Guice opened as a drive-thru stand on the South Hill. While not juice, another notable opening in the healthy category is the area's first kombucha taproom, Bare Culture Kombucha, in the midtown section of Coeur d'Alene. Owner Heather Threadgill brews the fermented tea with all kinds of crazy-good infused flavors like honey crisp cranberry and strawberry coconut. Food trucks made it onto the big screen in 2014 with Jon Favreau's film Chef, about a Los Angeles chef going out on his own to start a food truck. On the street in Spokane, food trucks did just as well. Several food truck rallies, where a handful of food trucks gathered downtown, occurred since the first one took place last December. The city's first Food Truck Palooza was a big hit, with 1,500 people in attendance. Eighteen vendors filled the parking lot near Luigi's Restaurant, and each attendee bought an entry ticket that allowed them free samples from all of the trucks. 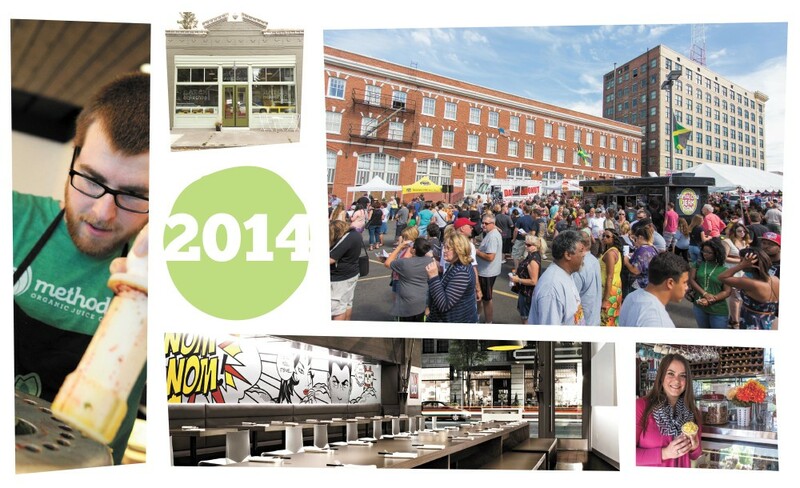 It looks like the coming year might have even more in store for the food truck scene. A year-round food truck park is currently in development at a lot near the corner of Sprague Avenue and Perry Street. The park, set to hold eight to 10 food trucks, picnic tables and a heated area for wintertime, is slated to open early next year. A few more trucks joined the ranks of those already traversing the Inland Northwest streets, including The Pizza Truck and 3 Ninjas, a taco truck where they make their own chipotle tortillas. A couple of mobile businesses also ventured into stationary storefronts. Veraci Pizza spent several years on wheels with a clay oven, but this summer they opened a brick-and-mortar restaurant in Kendall Yards. The popular Bistro Box truck announced plans to open a food market, called Fresh Plate, in addition to their food truck. Anthony's Beach Cafe — part of the restaurant family that owns Anthony's at Spokane Falls — opened up in the new Regal Plaza where the South Hill got a Target. Other eateries are slated to soon pop up around it, including Ezell's Famous Chicken, Jersey Mike's Subs and Mod Pizza. Coeur d'Alene's beloved coffee shop and downtown hangout, Java on Sherman, moved down the road a ways to a larger spot where they expanded their menu. Vault Coffee opened in Java's old digs. Batch Bakeshop and Brain Freeze Creamery had both been operating for years without storefronts until they opened their own this year, Batch in West Central and Brain Freeze in Kendall Yards. Chef Adam Hegsted (formerly of Coeur d'Alene Casino Resort) opened not one but two restaurants in Kendall Yards: The Wandering Table and Yards Bruncheon. The family behind Madeleine's Cafe and Casper Fry opened Durkin's Liquor Bar at 415 W. Main Ave. and temporarily closed Madeleine's in order to reopen it next to Durkin's this January. The ramen trend arrived in Spokane with the opening of Nudo, featuring shoyu ramen, miso ramen, seafood ramen and ramen burgers. As for the closings, Dawn of the Donut opened in 2013 much to the joy of zombie fans, but closed in September and transformed into Casual Friday Donuts, now run by the owners of Celebrations Bakery.